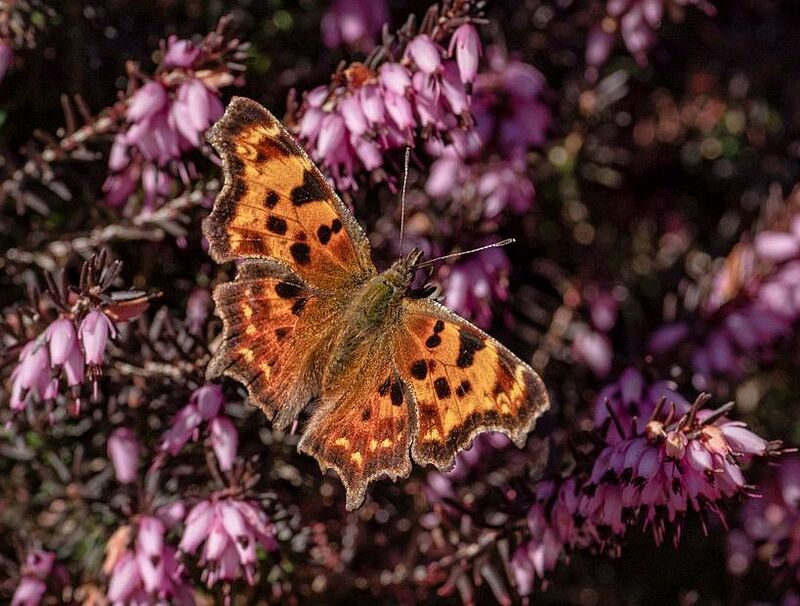 Gordon Hart writes: With the snow still melting in shady areas, Anne-Marie and I watched a Green Comma Polygonia faunus yesterday (March 17) nectaring on purple heather flowers. It posed long enough for me to get some underside shots showing numerous green flecks, so this was likely a male. I have attached an upperside and underside view. The underside view shows a vespid species above on the other side of the flower raceme. We saw several different bumblebee species, a bee-like syrphid fly, and several other bee and fly species. What a glorious day! Jeremy Tatum comments: Commas often rest head downwards, but in this instance it also happens to be a convenient position for getting at the nectar! The wasp may be Polistes dominula – but we’d need to see a bit more of the antennae to be sure. 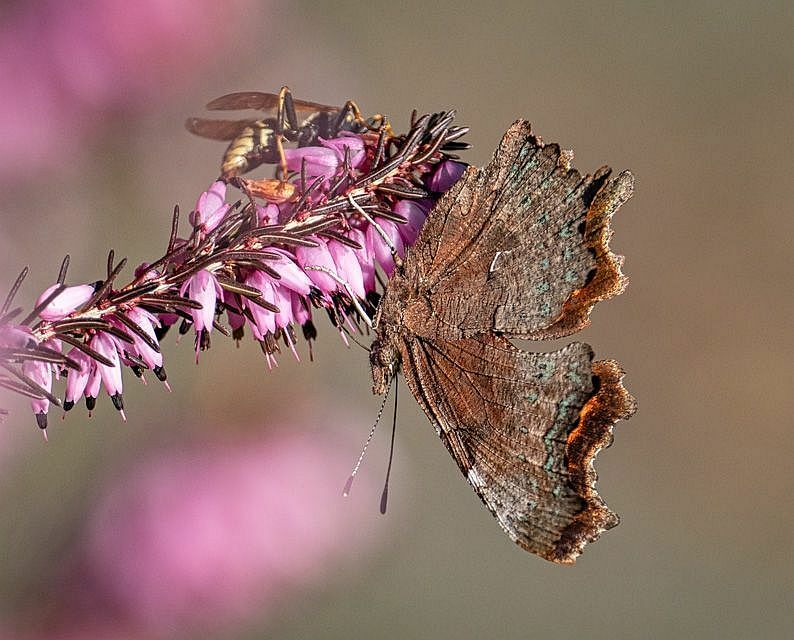 Jeremy Gatten writes: I had my first butterfly of the year, a Mourning Cloak, on March 16th in South Valley Park in Saanich. I see that Alan MacLeod had one on March 17th [don’t know where! – JT] – he managed a photo that he put up on Flickr, which is how I came across his sighting: https://flic.kr/p/2dQKqKH Although I could not confirm which species, I saw an orange nymphalid in the distance today that I suspect could have been Satyr Comma. And, just at press time, we have received two observations of Cabbage Whites. Kirsten Mills saw two today March 18 at 2:30pm in Brentwood Bay on Harding Lane, and Ron Flower had three in his yard in Royal Oak. Butterfly! Jochen Möhr writes: I just wanted to report the first sighting of a Cabbage White in Metchosin (William Head Road/Lombard Road area) on Friday afternoon, March 15. I find particularly the video, the second one, impressive. Jeremy Tatum writes: I couldn’t find a butterfly today, so I was reduced to photographing a pair of kelp flies on Mount Douglas Beach instead. Now that it’s less cold than it has been for some time, a few insects are beginning to stir. 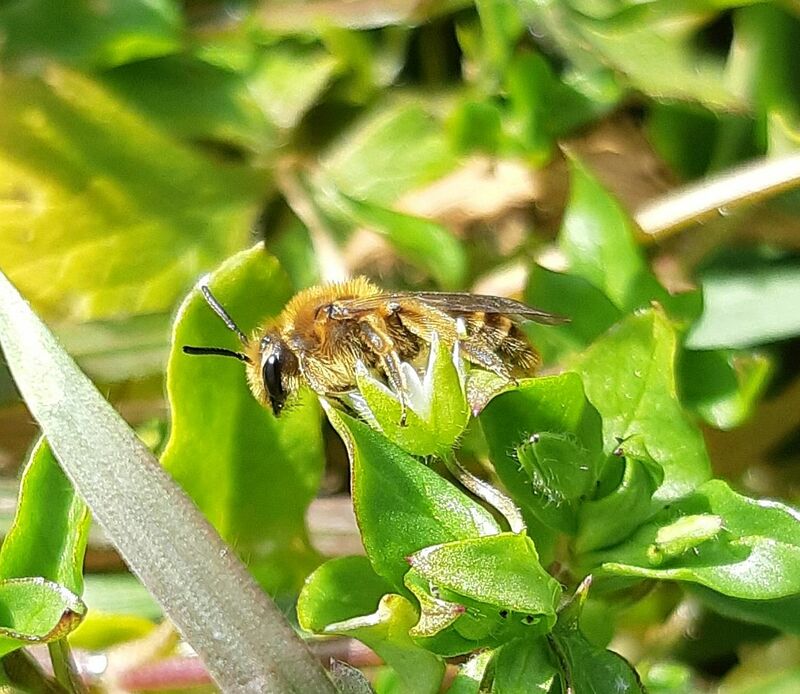 Nathan Fisk saw the bee below in Oak Bay on March 13. It looks rather like a Honey Bee Apis mellifera, but we can’t be quite sure, so I’ll just label it “bee”! 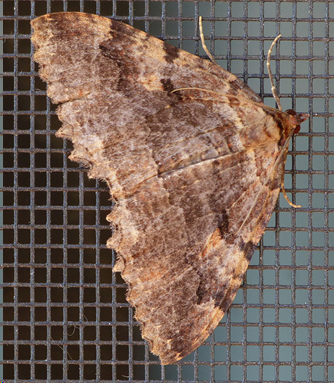 Jochen Möhr sends a picture of an American Tissue Moth Triphosa haesitata from Metchosin. Jeremy Tatum writes: As this cold weather continues, I am still reduced to photographing firebrats and similar indoor invertebrates in my apartment building. We have two species of firebrat in the building – the common Thermobia domestica and the less common Ctenolepisma longicaudata, and I’m not 100 percent certain which this one is. T.domestica usually has a well-defined brown mottled pattern (see February 19), while C. longicaudata is usually fairly uniformly grey. To the unaided eye, this one looked grey, but the photograph shows it to have quite a lot of mottling. 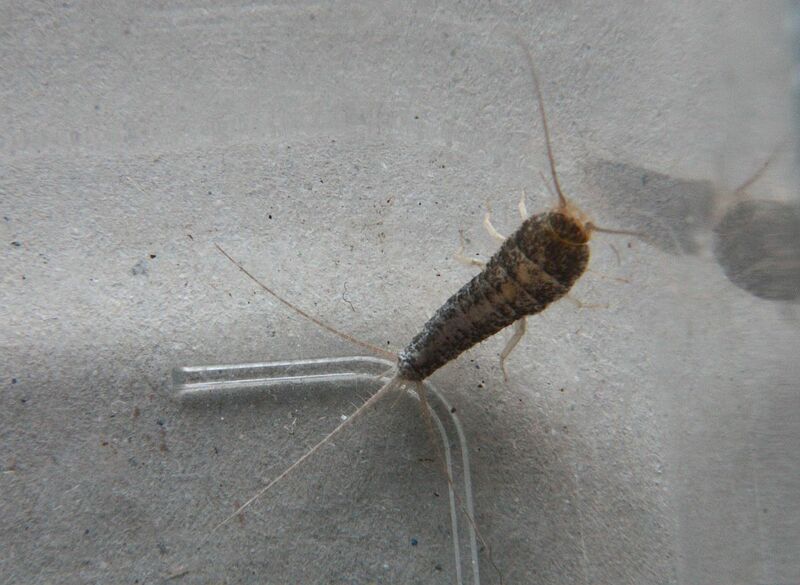 However, I think it has the long abdomen typical of longicaudata, rather than the stubby domestica abdomen, so I think it is Ctenolepisma longicaudata. I suppose there might be the possibiliy of hybridization, or of a different species, but that’s just idle speculation. The ever-busy taxonomists have been hard at work on these animals. 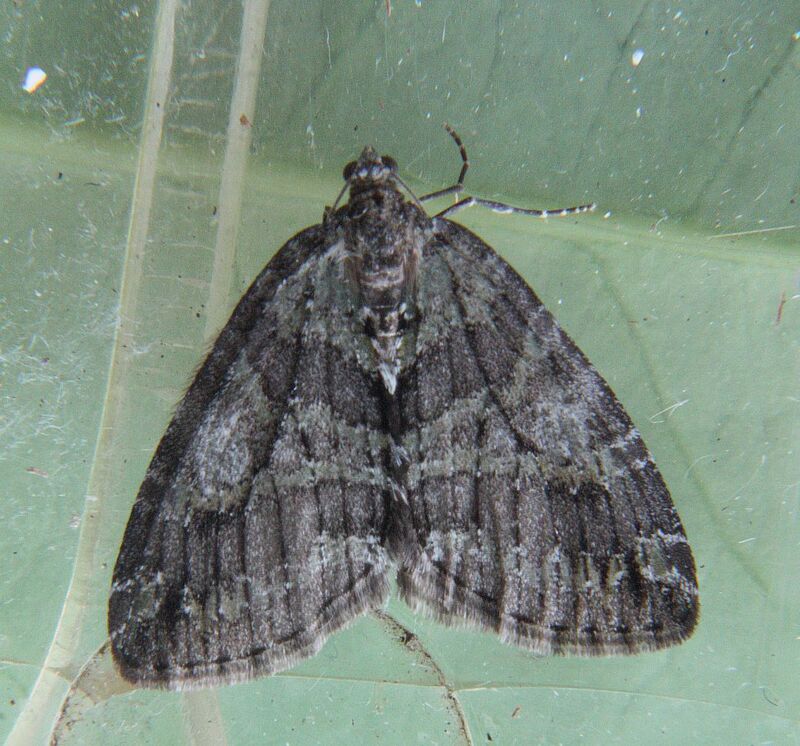 On this site I have been listing them in the Order Thysanura (three-pronged bristletails), but some authors are now calling the Order Zygentoma, and some seem not to be certain as to what Class to put them in.